Andy Griffith died this week, but the fictional TV town he created remains one of the most enduring myths of American popular culture, writes Rod Dreher. These days, Mayberry lives on in American pop culture only as a cringeworthy example of false nostalgia. Mayberry, the gentle Southern small town in which Andy Griffith served as the sheriff in the enduringly popular 1960s television comedy The Andy Griffith Show, has long been derided as a symbol of a cornpone utopia. We are instructed to spite Mayberry as a kind of ironic inoculation against the supposed unrealism of a traditional, square way of life. You can't go back to Mayberry, they say, by which they mean forget it, small-town and rural life is over, and was a lie in the first place. They're right, insofar as what one sees on television isn't an accurate and complete depiction of reality. This is hardly a radical insight. Griffith himself always said that Mayberry was a myth. 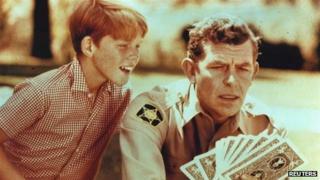 Image caption Andy Griffith's star on the Hollywood Walk of Fame - but did his show propagate a lie? But that is not to say the whole place was a lie. Myths use untruths - made-up stories - to tell profound truths about human nature. Mayberry spoke to something deep and true in the American character. Mayberry is a sleepy, slightly eccentric country village where nothing much happens, problems are mild and manageable, and conflicts are solved through neighbourliness and the application of aw-shucks common sense (usually the sheriff's). Mayberry's is a natural order undergirded by everyday kindness and a sense of the common good - that people look out for each other. Even Otis, the town drunk, takes care to lock himself in Mayberry's lone jail cell when he's on a bender. Something like that actually happened in St Francisville, my rural Southern hometown. Mr Charlie, a sweet-natured older man who couldn't handle drink, worked out an arrangement with local authorities under which he was free during the day to go to his job stocking shelves at a local grocery store, and at night he would go sleep in the town jail. As a teenager, I worked in that market, and once found Mr Charlie's whiskey hidden in the cistern of the store's toilet. Mr Charlie must have been tight much of the time he worked on our store crew, but we never could tell. He was a decent man who was treated humanely in his brokenness. It was a very Mayberry thing to have done. Image caption Small-town America: A cesspit of intolerance or cornpone utopia? Without a doubt there was, and is, darkness in country towns like mine; wherever you find people, there you will also find sin and failing. When I was an older teenager, I was a bullied social outcast. I left convinced that towns like my own were cesspits of intolerance and meanness behind a facade of folksiness. As I grew older, I came to understand that society is far more complicated than teenagers can imagine, and that I had in fact come from a pretty good place. But I never imagined moving back, and I remained the kind of jumped-up cosmopolitan who liked to mock the idea of Mayberry. Two years ago, my younger sister Ruthie, a teacher in the local school, was diagnosed with terminal cancer. And then, like Brigadoon emerging out of the mist, Mayberry showed itself. Scores of people in St Francisville came out to help my sister and her family, and remained with her steadfastly until her death. The love and service the people of this town of 2,000 souls gave to Ruthie was breathtaking. And for my wife and me, it was life-changing. By the end of the week of Ruthie's funeral and its aftermath, we had seen enough to know that we had to be part of a rural place where neighbourly virtue is so common, and so close to hand. Since my self-exile, I had lived in New York City, Washington DC, Dallas, and Philadelphia - but the light that emerged from my sister's death and dying showed me the way home to a place that looks and feels a lot like Mayberry. The point is surely not that small towns have no problems. I live here now and see the serious challenges, like chronic poverty. The difference is that there exists in human-sized places far more of a Mayberry-like sense of community, a conviction that one looks out for one's neighbours because it's the right thing to do. The myth of Mayberry is important to keep alive because it gives us an ideal to which we may to aspire. Of course Mayberry is a utopia, and by nature unrealisable. Yet by deriding it as nothing more than an illusion, critics make the perfect enemy of the everyday goodness which we can and should work. Andy Griffith, raised in rural North Carolina, embodied the best of what small-town and country life in America could be. Mayberry is not a place, but a state of mind. Its status as a pop culture icon would not have been reached or have lasted for decades if it didn't speak to a profound, even poetic, longing within Americans. We mock the Mayberry ideal, and yet wonder why contemporary life is so often harsh, noisy, lonely and disordered.